2) All price packages are charged on a PER PERSON BASIS. 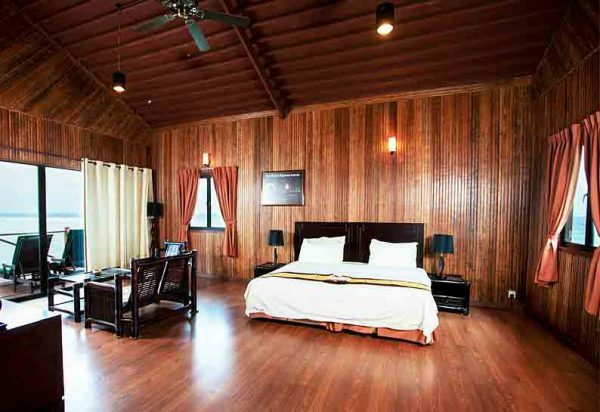 3) All villas are designed to cater for 2 persons to ensure best quality and comfort. Guest travelling in a family, the arrangement for extra beds is available upon early request. 4) Room based on sharing basis (twin / triple share) – subject to room availability. 5) There will be extra MYR 60 per day charge served for for Celiac / Gluten free meals request. Please inform us in your booking to avoid any inconvenience. 1) Child from 3 – 11 years old is chargeable at child rate provided they stay in the same chalets with parents. 2) Infants below 3 years old are Free of Charge. 3) Adult rate shall apply to whoever aged 12 and above. 1) Single Occupancy: An additional 50% of the package rate will be charged. 2) Additional surcharges may apply for single travelers during scheduled or unscheduled land and boat transfers. ** The dive price includes air tanks (12 liter), belt and weights, boat transfer to dive site, dive guide. All diving activities are scheduled in advance. No last minute divers. Please schedule morning dives the night before, at the dive desk, from 7:00pm to 8:00 pm & all afternoon dives, either the night before, or that morning, before lunch. Divers are responsible to be at the dive center by 8:15 am for morning dives, and by 2:15 pm for afternoon dives or time advised by dive center staff during diving registration. * Two boat dives to other islands nearby Pom Pom, with a minimum of 2 divers in the morning. * One boat dive around Pom Pom Island in the afternoon, with no minimum. * Single diver may only dive around Pom Pom Island but it is always possible to join the snorkeling boat heading to other islands without surcharge or opt for a private boat charter. * Dive sites in the surrounding islands (Will be organized and subjected to our Dive Instructor / Dive master’s recommendation based on weather and sea conditions). * Any out of dive center’s operation hours diving to be charged separately but subjected to availability of boat crew, dive guide/ instructor. * Private dive guide/instructor can be arranged subjected to availability of dive guide/instructor with surcharge. Islands around Pom Pom are: Pulau Boheydulang (Tun Sakaran Marine Park), Pulau Mantabuan (Tun Sakaran Marine Park), Pulau Timba Timba, Pulau Pandanan, Pulau Mataking. Diving package strictly for CERTIFIED DIVERS ONLY, who are in good health and fitness. Diver with medical condition should get clearance from medical physician/practitioner. Proof of diving certification must be shown before/during dive booking. The dive price includes air tanks (12 litre), belt and weights, boat transfer to dive site, dive guide. Full SCUBA equipment and underwater camera are available for rent at dive center. The Dive Manager and/or Dive Instructors/Dive Guides reserve the right to stop any dive activity if the dive centre policy is not respected, especially if divers are standing, sitting, bumping or touching the corals, or other marine animals. Each dive package is valid for 1 person only: it may not be shared and non-transferable. Any booked dive package is not refundable in the event of a “no show”, last minute cancellation or surplus dives. PomPom PADI Dive Centre adheres to PADI’s established no fly time periods. The use of personal dive computers is highly recommended, and a single dive computer to be shared by multiple divers are not allowed. Diver who dive without computer must have a watch + depth gauge + demonstrate the use of the RDP table. Prepaid Dive Course & E-learning from PADI WEBSITE: If you wish to do a course, you must obtain a Medical certificate specifically FOR DIVING ACTIVITY before booking or starting the E-learning. Even though you can do your theory before your arrival, online through PADI’s website, YOU WILL NEED TO PASS A QUICK REVIEW EXAM BEFORE CONTINUING WITH THE COURSE. You only need to do the practical sessions in the water thereafter. Prepaid courses are non-refundable. * Book in advance at least 5 dives packages. * Able to show proof of 100+ logged dives experience. * Do a compulsory local orientation house reef dive with resort’s dive guide. * Self-diving is only available from 9.00am and 5.00pm (back to surface) and is subjected to availability and approval by the dive center. * Can only begin after a minimum of 1 hour surface interval from previous dive. * Dive at your own risk. The resort and Borneo Calling Tour is not liable for any incident and/or accident experienced during a self-diving activity. All divers are strongly advised to avoid self-diving during the boat transfer operation time. * The Dive Manager and Dive Instructors reserve the right to stop providing self-diving if the rules and regulations are not respected. * The Rules and Regulations are subject to change without prior notice. * All certified divers must do a Scuba Review if have not been diving for more than 2 years. * Certified Diver with less than 50 logged dives and last dive more than 1 year must do a Scuba Review. * Certified Diver with over 50 logged dives and last dive more than 1 year may be required to do a Check Out Dive. * First dive will always be conducted at safe environment on PomPom Island. Guests may request boat dive to other islands for additional/subsequent dives if completed SCUBA skills satisfactorily, subjected to approval from conducting SCUBA Instructor and availability of resort’s boat. * DSD will normally be conducted at 8.30am-10.30am (AM session) or at 2.30pm-4.30pm (PM session). * DSD fees shall not be either fully/partially refunded once the course is started. * Underwater camera may be allowed subjected to conducting SCUBA Instructor’s approval. * Price includes usage of full SCUBA equipment and classroom, standby/safety boat and SCUBA Instructor’s fees. * Maximum of 2 divers per SCUBA Instructor. Private SCUBA Instructor may be possible for booking at an additional RM100 and is subjected to availability of SCUBA Instructor. All types of activities being offered by the resort on the island especially dive activities are subjects to bad sea, weather conditions / poor visibility and also divers’ own physical abilities (e.g. : injuries, intoxification, hangovers, etc.). Therefore, we reserve the final decision and rights to either proceed or abort any activities / dives for any safety reasons. Borneo Calling and Pom Pom Island Resort cannot be held responsible, or in any liable, for any injury, property losses, personal losses, accidents, death or damage to personal equipment for any reason whatsoever, whether through acticity booked through us or caused to you by third parties, whilst staying at the resort, or during participation in any activity. We strongly recommend that all guests take up adequate travel insurance that covers accident, loss caused by cancellations, loss of baggage, personal property, medical expenses, medical evacuation and weather disruption that caused any acitivity cancellations. Guests intending on participating in diving activities must ensure their insurance covers them for SCUBA related activities and has appropriate ‘depth’ coverage. All guest will be required to read and sign the company Standard Liability Form and other related forms at the resort upon arrival and check-in. Pick up from Tawau Airport or Hotel at Semporna and transfer to Jetty. Depart from jetty to Pom Pom Island Resort Resort. Arrived at Pom Pom Island. Check in to your accommodation. Meal will be served at resort’s restaurant. Free at own leisure. Diver Package : Proceed to boat dives. Non-diver can snorkel around the resort, hiking/trekking to “Bohey Dulang” island or free at own leisure. **For guideline only & all flight schedules are subject to change without prior noticefor guideline only & all flight schedules are subject to change without prior notice! Guest who cancel, amend, or not check in to resort due to personal reason or flight delay, package is not refund/amend / transfer to third party. In any case of flight delay and thus not check in to resort on the same day, resort will not responsible for the accommodation & food. Is subjected to availability of resort’s boat and is only possible between 8.30am-5.30pm. Guests will be charged full price for “no-show” or “last minute” cancellation. Kindly refers to Pom-Pom Dive Center staff for maximum allowable occupant per boat charter, destinations, activity and price. Charter price include return boat transfer to agreed location(s), professional private excursion guide(s), beach towel and some refreshments. Tawau Area: Meet at 8am at hotel lobby. We will first go to pick up guest at Tawau Airport, then head to Semporna Jetty for 12.30pm scheduled boat. Semporna Area: Meet at 11.15am at hotel lobby. We will head to Semporna Jetty for 12.30pm scheduled boat. ** Upon arrival at Tawau airport prior to land transfer to the resort, all guests are required to sign a liability release (waiver) form to express an assumption of risk. Pom Pom Island is 30km NE of Semporna in Sabah, East Malaysia. It is a small white sand island completely surrounded by coral reefs in the province of Sabah which is a great destination for visitors who want an unforgettable vacation. Pom Pom island got its name from the Pom Pom tree which grows abundantly on the island and has become quite a symbol of the place. Pom Pom Island Resort is around 45 minutes by boat from Semporna, Borneo’s coast; it has rich tropical vegetation and is surrounded by white sand and the turquoise waters of the Celebes Sea. It is on part of this beautiful island that Pom Pom Island finds it home. This little atoll, which takes about an hour to walk around, is often a shelter for both Green and Hawksbill marine turtles that during the night return to the beach to nest. During your vacation, if you are lucky, you might witness the hatching of the eggs and release of baby turtles to the sea. The resort consists of Beach Front Villas, Garden View Villas and Water Villas, which are constructed in traditional architecture to blend into the native surroundings without disturbing or removing the islands natural vegetation. The fresh and cooling sea breeze let you feel comfortable and relaxed throughout your stay. All villas are air conditioned, contain private balconies and have an attached bathroom with freshwater supply.